The Pirate Ship Blue and Brown Children's Table and 2 Chairs serve as a fun addition to any bedroom of a young creative. The set-up boasts a spacious table and two chairs, providing the perfect area for your child to express their artistic power, offering a fun pirate-themed design to add a splash of colour and excitement to your child's bedroom. The Pirate Ship Blue and Brown Children's Table and 2 Chairs are painted to represent authentic pirate-ship wood, with pirate paintings to add a little extra character and colour. 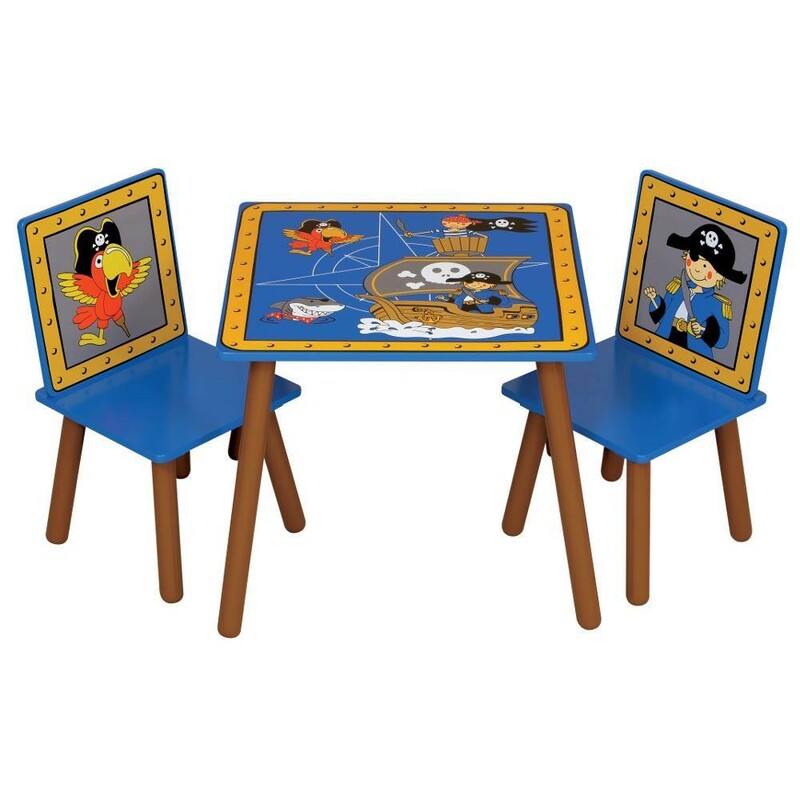 The Pirate Ship Blue and Brown Children's Table and 2 Chairs are finished with brown and blue paint, as the name suggests, to create a nautical theme and includes fun illustrated characters for a creative, playful finish. The square design with rounded legs represents a fun pirate-themed structure, which will fit perfectly in any children's bedroom. Constructed from high quality materials, the Pirate Ship Blue and Brown Children's Table and 2 Chairs are built to endure wear-and-tear. Coated in a resistant paint, the Pirate Ship Blue and Brown Children's Table and 2 Chairs are sure to stand the test of time and remain sturdy and secure for your little ones. These two seated areas are perfect for playtime and creative activities to keep minds busy. Every Pirate Ship Blue and Brown Children's Table and 2 Chairs are built for easy self-assembly and are delivered flat packed for your convenience. The Pirate Ship Blue and Brown Children's Table and 2 Chairs is part of the Pirate Ship collection, allowing you to carry this fun theme throughout the whole bedroom.